Banded iron formations (BIFs) are sedimentary rocks containing more than 15% iron composed predominantly of thinly bedded iron minerals and silica (as quartz). Banded iron formations occur exclusively in Precambrian rocks, and are commonly weakly to intensely metamorphosed. 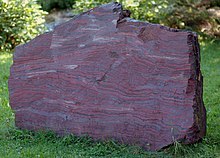 Banded iron formations may contain iron in carbonates (siderite or ankerite) or silicates (minnesotaite, greenalite, or grunerite), but in those mined as iron ores, oxides (magnetite or hematite) are the principal iron mineral. Banded iron formations are known as taconite within North America. The mining involves moving tremendous amounts of ore and waste. The waste comes in two forms, non-ore bedrock in the mine (overburden or interburden locally known as mullock), and unwanted minerals which are an intrinsic part of the ore rock itself (gangue). The mullock is mined and piled in waste dumps, and the gangue is separated during the beneficiation process and is removed as tailings. Taconite tailings are mostly the mineral quartz, which is chemically inert. This material is stored in large, regulated water settling ponds. DSO deposits are typically rarer than the magnetite-bearing BIF or other rocks which form its main source or protolith rock, but are considerably cheaper to mine and process as they require less beneficiation due to the higher iron content. However, DSO ores can contain significantly higher concentrations of penalty elements, typically being higher in phosphorus, water content (especially pisolite sedimentary accumulations) and aluminum (clays within pisolites). Export grade DSO ores are generally in the 62–64% Fe range. Occasionally granite and ultrapotassic igneous rocks segregate magnetite crystals and form masses of magnetite suitable for economic concentration. A few iron ore deposits, notably in Chile, are formed from volcanic flows containing significant accumulations of magnetite phenocrysts. Chilean magnetite iron ore deposits within the Atacama Desert have also formed alluvial accumulations of magnetite in streams leading from these volcanic formations. For every 1 ton of iron ore concentrate produced approximately 2.5-3.0 tons of iron ore tailings will be discharged. Statistics show that there are 130 million tons of iron ore discharged every year. If for example the mine tailings contain an average of approximately 11% iron there would be approximately 1.41 million tons of iron wasted annually. These tailings are also high in other useful metals such as Cu, Ni, and Co and they can be used for road building materials like pavement and filler and building materials such as cement, low grade glass, and wall materials. While tailings are a relatively low grade ore, they are also inexpensive to collect as they don't have to be mined. Because of this companies such as Magnetation Inc. have started reclamation projects where they use iron ore tailings as a source of metallic iron. The two main methods of recycling iron from iron ore tailings are magnetizing roasting and direct reduction. Magnetizing roasting uses temperatures between 700 and 900 °C for a time of under 1 hour to produce an iron concentrate (Fe3O4) to be used for iron smelting. For magnetizing roasting it is important to have a reducing atmosphere to prevent oxidization and the formation of Fe2O3 because it is harder to separate as it is less magnetic. Direct reduction uses hotter temperatures of over 1000 °C and longer times of 2–5 hours. Direct reduction is used to produce sponge iron (Fe) to be used for steel making. Direct reduction requires more energy as the temperatures are higher and the time is longer and it requires more reducing agent than magnetizing roasting. One method relies on passing the finely crushed ore over a slurry containing magnetite or other agent such as ferrosilicon which increases its density. When the density of the slurry is properly calibrated, the hematite will sink and the silicate mineral fragments will float and can be removed. 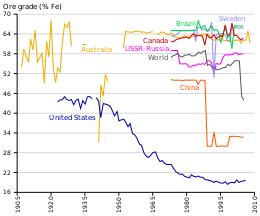 Evolution of the extracted iron ore grade in different countries (Canada, China, Australia, Brazil, United States, Sweden, USSR-Russia, world). The recent drop in world ore grade is due to the big consumption of low grade Chinese ores. The American ore is upgraded between 61% to 64% before being sold. Mining iron ore is a high volume low margin business, as the value of iron is significantly lower than base metals. It is highly capital intensive, and requires significant investment in infrastructure such as rail in order to transport the ore from the mine to a freight ship. For these reasons, iron ore production is concentrated in the hands of a few major players. The seaborne trade in iron ore, that is, iron ore to be shipped to other countries, was 849m tonnes in 2004. Australia and Brazil dominate the seaborne trade, with 72% of the market. BHP, Rio and Vale control 66% of this market between them. In Australia iron ore is won from three main sources: pisolite "channel iron deposit" ore derived by mechanical erosion of primary banded-iron formations and accumulated in alluvial channels such as at Pannawonica, Western Australia; and the dominant metasomatically-altered banded iron formation related ores such as at Newman, the Chichester Range, the Hamersley Range and Koolyanobbing, Western Australia. Other types of ore are coming to the fore recently, such as oxidised ferruginous hardcaps, for instance laterite iron ore deposits near Lake Argyle in Western Australia. The total recoverable reserves of iron ore in India are about 9,602 million tonnes of hematite and 3,408 million tonnes of magnetite. Chhattisgarh, Madhya Pradesh, Karnataka, Jharkhand, Odisha, Goa, Maharashtra, Andhra Pradesh, Kerala, Rajasthan and Tamil Nadu are the principal Indian producers of iron ore. World consumption of iron ore grows 10% per annum on average with the main consumers being China, Japan, Korea, the United States and the European Union. China is currently the largest consumer of iron ore, which translates to be the world's largest steel producing country. It is also the largest importer, buying 52% of the seaborne trade in iron ore in 2004. China is followed by Japan and Korea, which consume a significant amount of raw iron ore and metallurgical coal. In 2006, China produced 588 million tons of iron ore, with an annual growth of 38%. In recent years, however, this benchmark system has begun to break down, with participants along both demand and supply chains calling for a shift to short term pricing. Given that most other commodities already have a mature market-based pricing system, it is natural for iron ore to follow suit. To answer increasing market demands for more transparent pricing, a number of financial exchanges and/or clearing houses around the world have offered iron ore swaps clearing. The CME group, SGX (Singapore Exchange), London Clearing House (LCH.Clearnet), NOS Group and ICEX (Indian Commodities Exchange) all offer cleared swaps based on The Steel Index's (TSI) iron ore transaction data. The CME also offers a Platts-based swap, in addition to their TSI swap clearing. The ICE (Intercontinental Exchange) offers a Platts-based swap clearing service also. The swaps market has grown quickly, with liquidity clustering around TSI's pricing. By April 2011, over US$5.5 billion worth of iron ore swaps have been cleared basis TSI prices. By August 2012, in excess of one million tonnes of swaps trading per day was taking place regularly, basis TSI. Singapore Mercantile Exchange (SMX) has launched the world first global iron ore futures contract, based on the Metal Bulletin Iron Ore Index (MBIOI) which utilizes daily price data from a broad spectrum of industry participants and independent Chinese steel consultancy and data provider Shanghai Steelhome's widespread contact base of steel producers and iron ore traders across China. The futures contract has seen monthly volumes over 1.5 million tonnes after eight months of trading. This move follows a switch to index-based quarterly pricing by the world's three largest iron ore miners - Vale, Rio Tinto and BHP - in early 2010, breaking a 40-year tradition of benchmark annual pricing. The iron ore reserves at present seem quite vast, but some are starting to suggest that the math of continual exponential increase in consumption can even make this resource seem quite finite. For instance, Lester Brown of the Worldwatch Institute has suggested iron ore could run out within 64 years based on an extremely conservative extrapolation of 2% growth per year. Geoscience Australia calculates that the country's "economic demonstrated resources" of iron currently amount to 24 gigatonnes, or 24 billion tonnes. The current production rate from the Pilbara region of Western Australia is approximately 430 million tonnes a year and rising. Gavin Mudd (Monash University) and Jonathon Law (CSIRO) expect it to be gone within 30 to 50 years (Mudd) and 56 years (Law). These estimates require on-going review to take into account shifting demand for lower grade iron ore and improving mining and recovery techniques (allowing deeper mining below the groundwater table). In 2011, leading Pilbara-based iron ore miners – Rio Tinto, BHP Billiton and Fortescue Metals Group (FMG) – all announced significant capital investment in the development of existing and new mines and associated infrastructure (rail and port). Collectively this would amount to the production of 1,000 million tonnes per year (Mt/y) by 2020. Practically that would require a doubling of production capacity from a current[when?] production level of 470 Mt/y to 1,000 Mt/y (an increase of 530 Mt/y). These figures are based on the current[when?] production rates of Rio 300 Mt/y, BHP 240 Mt/y, FMG 55 Mt/y and Other 15 Mt/y increasing to Rio 360 Mt/y, BHP 356 Mt/y, FMG 155 Mt/y and Other 140 Mt/y (the latter 140 Mt/y is based on planned production from recent[when?] industry entrants Hancock, Atlas and Brockman through Port Hedland and API and others through the proposed Port of Anketell). In March 2014, Fortescue officially opened its 40 million-tonne per annum (mtpa) Kings Valley project, marking the completion of a US$9.2 billion expansion that increased its production capacity to 155 mtpa. The expansion included the construction of the greenfields Solomon Hub in the Hamersley Ranges, one of the world's largest iron ore developments comprising Kings Valley and the nearby 20 mtpa Firetail mine; an expansion of the Christmas Creek mine to 50 mtpa; and major extensions of Fortescue's world-class port and rail facilities. A production rate of 1,000 Mt/y would require a significant increase in production from existing mines and the opening of a significant number of new mines. Further, a significant increase in the capacity of rail and port infrastructure would also be required. For example, Rio would be required to expand its port operations at Dampier and Cape Lambert by 140 Mt/y (from 220 Mt/y to 360 Mt/y). BHP would be required to expand its Port Hedland port operations by 180 Mt/y (from 180 Mt/y to 360 Mt/y). FMG would be required to expand its port operations at Port Hedland by 100 Mt/y (from 55 Mt/y to 155 Mt/y). That is an increase of 420 Mt/y in port capacity by the three majors Rio, BHP and FMG and about at least 110 Mt/y from the non-major producers. Based on the rule-of-thumb of 50 Mt/y per car dumper, reclaimer and ship-loader the new production would require approximately 10 new car dumpers, reclaimers and ship-loaders. New rail capacity would also be required. Based on the rule-of-thumb of 100 Mt/y per rail line, increasing production by approximately 500 Mt/y would require five new single rail lines. One scenario is an extra rail line for all the majors: BHP (from double to triple track), Rio (double to triple track), FMG (single to double track) and at least two new lines. Hancock Prospecting has recently[when?] started production from its Roy Hill Iron Ore Mine located north of Newman. This project included the development of the Roy Hill deposit, the construction of a 344 km railway and a port facility with an annual throughput of 55 Mt and QR National to service non-major producers, as of December 2015 due to the falling iron ore price these plans have been suspended indefinitely. In 2014 mines in the United States produced 57.5 million metric tons of iron ore with an estimated value of $5.1 billion. Iron mining in the United States is estimated to have accounted for 2% of the world’s iron ore output. In the United States there are 12 iron ore mines with 9 being open pit mines and 3 being reclamation operations. There were also 10 pelletizing plants, 9 concentration plants, 2 direct-reduced iron (DRI) plants and 1 iron nugget plant that where operating in 2014. In the United States the majority of iron ore mining is in the iron ranges around Lake Superior. These iron ranges occur in Minnesota and Michigan which combined accounted for 93% of the usable iron ore produced in the United States in 2014. Seven of the nine operational open pit mines in the United States are located in Minnesota as well as 2 of the 3 tailings reclamation operations. The other 2 active open pit mines were located in Michigan, in 2016 one of the 2 mines shut down. There have also been iron ore mines in Utah and Alabama however the last iron ore mine in Utah shut down in 2014 and the last iron ore mine in Alabama shut down in 1975. In 2017 Canadian iron ore mines produced 49 million tons of iron ore in concentrate pellets and 13.6 million tons of crude steel. Of the 13.6 million tons of steel 7 million was exported, and 43.1 million tons of iron ore was exported at a value of $4.6 billion. Of the iron ore exported 38.5% of the volume was iron ore pellets with a value of $2.3 billion and 61.5% was iron ore concentrates with a value of $2.3 billion. The majority of Canada's iron ore comes from Nunavut and from Labrador along the Quebec and Newfoundland and Labrador border. Brazil is the second largest producer of iron ore with Australia being the largest. 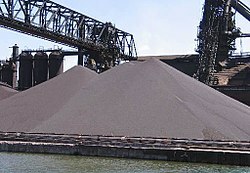 In 2015 Brazil exported 397 million tons of usable iron ore. In December 2017 Brazil exported 346,497 metric tons of iron ore and from December 2007 to May 2018 they exported a monthly average of 139,299 metric tons. Phosphorus (P) has four major effects on iron: increased hardness and strength, lower solidus temperature, increased fluidity, and cold shortness. Depending on the use intended for the iron, these effects are either good or bad. Bog ore often has a high phosphorus content (Gordon 1996, p. 57). The addition of phosphorus has a down side. At concentrations higher than 0.2% iron becomes increasingly cold short, or brittle at low temperatures. Cold short is especially important for bar iron. Although bar iron is usually worked hot, its uses[example needed] often require it to be tough, bendable, and resistant to shock at room temperature. A nail that shattered when hit with a hammer or a carriage wheel that broke when it hit a rock would not sell well. High enough concentrations of phosphorus render any iron unusable (Rostoker & Bronson 1990, p. 22). The effects of cold shortness are magnified by temperature. Thus, a piece of iron that is perfectly serviceable in summer, might become extremely brittle in winter. There is some evidence that during the Middle Ages the very wealthy may have had a high phosphorus sword for summer and a low phosphorus sword for winter (Rostoker & Bronson 1990, p. 22). Careful control of phosphorus can be of great benefit in casting operations. Phosphorus depresses the liquidus temperature, allowing the iron to remain molten for longer and increases fluidity. The addition of 1% can double the distance molten iron will flow (Rostoker & Bronson 1990, p. 22). The maximum effect, about 500 °C, is achieved at a concentration of 10.2% (Rostocker & Bronson 1990, p. 194). For foundry work Turner[who?] felt the ideal iron had 0.2–0.55% phosphorus. The resulting iron filled molds with fewer voids and also shrank less. In the 19th century some producers of decorative cast iron used iron with up to 5% phosphorus. The extreme fluidity allowed them to make very complex and delicate castings. But, they could not be weight bearing, as they had no strength (Turner 1900, pp. 202–204). There are two remedies[according to whom?] for high phosphorus iron. The oldest, and easiest, is avoidance. If the iron that the ore produced was cold short, one[who?] would search for a new source of iron ore. The second method involves oxidizing the phosphorus during the fining process by adding iron oxide. This technique is usually associated with puddling in the 19th century, and may not have been understood earlier. For instance Isaac Zane, the owner of Marlboro Iron Works did not appear to know about it in 1772. Given Zane's reputation[according to whom?] for keeping abreast of the latest developments, the technique was probably unknown to the ironmasters of Virginia and Pennsylvania. Aluminium is difficult to reduce. As a result, aluminium contamination of the iron is not a problem. However, it does increase the viscosity of the slag (Kato & Minowa 1969, p. 37 and Rosenqvist 1983, p. 311). This will have a number of adverse effects on furnace operation. The thicker slag will slow the descent of the charge, prolonging the process. High aluminium will also make it more difficult to tap off the liquid slag. At the extreme this could lead to a frozen furnace. There are a number of solutions to a high aluminium slag. The first is avoidance; don't use ore or a lime source with a high aluminium content. Increasing the ratio of lime flux will decrease the viscosity (Rosenqvist 1983, p. 311). Sulfur (S) is a frequent contaminant in coal. It is also present in small quantities in many ores, but can be removed by calcining. Sulfur dissolves readily in both liquid and solid iron at the temperatures present in iron smelting. The effects of even small amounts of sulfur are immediate and serious. They were one of the first worked out by iron makers. Sulfur causes iron to be red or hot short (Gordon 1996, p. 7). In cast iron sulfur promotes the formation of white iron. As little as 0.5% can counteract the effects of slow cooling and a high silicon content (Rostoker & Bronson 1990, p. 21). White cast iron is more brittle, but also harder. It is generally avoided, because it is difficult to work, except in China where high sulfur cast iron, some as high as 0.57%, made with coal and coke, was used to make bells and chimes (Rostoker, Bronson & Dvorak 1984, p. 760). According to Turner (1900, pp. 200), good foundry iron should have less than 0.15% sulfur. In the rest of the world a high sulfur cast iron can be used for making castings, but will make poor wrought iron. The importance attached to low sulfur iron is demonstrated by the consistently higher prices paid for the iron of Sweden, Russia, and Spain from the 16th to 18th centuries. Today sulfur is no longer a problem. The modern remedy is the addition of manganese. But, the operator must know how much sulfur is in the iron because at least five times as much manganese must be added to neutralize it. Some historic irons display manganese levels, but most are well below the level needed to neutralize sulfur (Rostoker & Bronson 1990, p. 21). Sulfide inclusion as manganese sulfide (MnS) can also be the cause of severe pitting corrosion problems in low-grade stainless steel such as AISI 304 steel. Under oxidizing conditions and in the presence of moisture, when sulfide oxidizes it produces thiosulfate anions as intermediate species and because thiosulfate anion has a higher equivalent electromobility than chloride anion due to its double negative electrical charge, it promotes the pit growth. Indeed, the positive electrical charges born by Fe2+ cations released in solution by Fe oxidation on the anodic zone inside the pit must be quickly compensated / neutralised by negative charges brought by the electrokinetic migration of anions in the capillary pit. Some of the electrochemical processes occurring in a capillary pit are the same than these encountered in capillary electrophoresis. Higher the anion electrokinetic migration rate, higher the rate of pitting corrosion. Electrokinetic transport of ions inside the pit can be the rate limiting step in the pit growth rate. ^ Sirkeci, A. A.; Gül, A.; Bulut, G.; Arslan, F.; Onal, G.; Yuce, A. E. (April 2006). "RECOVERY OF Co, Ni, AND Cu FROM THE TAILINGS OF DIVRIGI IRON ORE CONCENTRATOR". Mineral Processing and Extractive Metallurgy Review. 27 (2): 131–141. doi:10.1080/08827500600563343. ISSN 0882-7508. ^ Gzogyan, T. N.; Gubin, S. L.; Gzogyan, S. R.; Mel’nikova, N. D. (2005-11-01). "Iron losses in processing tailings". Journal of Mining Science. 41 (6): 583–587. doi:10.1007/s10913-006-0022-y. ISSN 1573-8736. ^ Uwadiale, G. G. O. O.; Whewell, R. J. (1988-10-01). "Effect of temperature on magnetizing reduction of agbaja iron ore". Metallurgical Transactions B. 19 (5): 731–735. doi:10.1007/BF02650192. ISSN 1543-1916. ^ Stephens, F. M.; Langston, Benny; Richardson, A. C. (1953-06-01). "The Reduction-Oxidation Process For the Treatment of Taconites". JOM. 5 (6): 780–785. doi:10.1007/BF03397539. ISSN 1543-1851. ^ Stewart, J.; Williams, D.E. (1992). "The initiation of pitting corrosion on austenitic stainless steel: on the role and importance of sulphide inclusions". Corrosion Science. 33 (3): 457–474. doi:10.1016/0010-938X(92)90074-D. ISSN 0010-938X. ^ Williams, David E.; Kilburn, Matt R.; Cliff, John; Waterhouse, Geoffrey I.N. (2010). "Composition changes around sulphide inclusions in stainless steels, and implications for the initiation of pitting corrosion". Corrosion Science. 52 (11): 3702–3716. doi:10.1016/j.corsci.2010.07.021. ISSN 0010-938X. ^ Newman, R. C.; Isaacs, H. S.; Alman, B. (1982). "Effects of sulfur compounds on the pitting behavior of type 304 stainless steel in near-neutral chloride solutions". Corrosion. 38 (5): 261–265. doi:10.5006/1.3577348. ISSN 0010-9312.